Don't think you have the space for that wine cellar you've been dreaming about? At Vigilant, we believe any spot can be transformed into a small wine room from spare bedrooms, to basement alcoves to unused office or garage space. Our team of experts are experienced in creating beautiful and functional designs to maximize storage in any space. They'll walk you through the design process step by step. Request Your FREE Wine Room Design Today! At Vigilant, custom requests are second nature for us. We are the manufacturer and can help you achieve the perfect wine storage solution to accommodate your space and your style. If you don't see a standard option that works for you, just ask us, we can help! This homeowner transformed some unused space in their house into a small wine room using Vigilant's standard Mahogany wine racking. The wine room features 5 and 10 column bead board arches with tabletops that create perfect serving areas. For wine storage, the homeowner chose ladder racking, a solid rectangular bin, conversion boxes and a 10-column diamond bin all finished in Vigilant's Harvest stain and lacquer. "My experience with Vigilant was fantastic! All the products were precise in terms of size/specifications, and the quality of the products and wood was fantastic. Very professional, and frankly great to see such quality for an American company. We did this as a DIY project against a basement wall, and it really exceeded our expectations in terms of final outcome. Best to you and your great company - I have been passing along recommendations." This homeowner had some extra space in their basement and transformed it into a small wine room. The wine racking and storage is made from Mahogany and finished in Vigilant's Chestnut stain and lacquer. The wine room features ladder racking with display rows, a diagonal cube display, curved corner racking and magnum bottle shelving. Enclosing the space, the homeowner used a fully insulated Vigilant Value Classic Full Glass Square Door. The door also includes two 30" glass sidelights making the wine collection a true focal point of the basement. This homeowner created a beautiful small wine room as an extension of their entertaining space. It features unfinished mahogany shelving and casework to add to the rustic style of the wine room. For wine storage, the space uses ladder racking with display rows, diamond bins, quarter round displays and magnum cubbies. There is also a decanting station in the wine room that is highlighted by a beautiful decorative bead board archtop. This small wine room housed within glass walls is the focal point of the entertaining space at this Lincoln, NE home. The cellar features a bead board archtop with LED lighting making for the perfect spot to pour a glass of wine. The cellar uses several storage components including diamond bins, rectangular bin cases and radius corner racking all finished in a custom stain. For added function and flare, the cellar includes a rolling ladder made from solid mahogany for easy access to any bottle of wine. This was a fun project for Vigilant to design a two-toned wine room to accentuate the clients slated stone walls. The cellar components was handcrafted from mahogany with the shelving stained in Vigilant's Harvest finish. To compliment the shelving, all the trim and table tops where finished in a dark espresso making all the details pop. The far wall is the focal point of the room with its inviting decorative arch and glass shelving perfect for showcasing and decanting their most cherished bottles of wine. 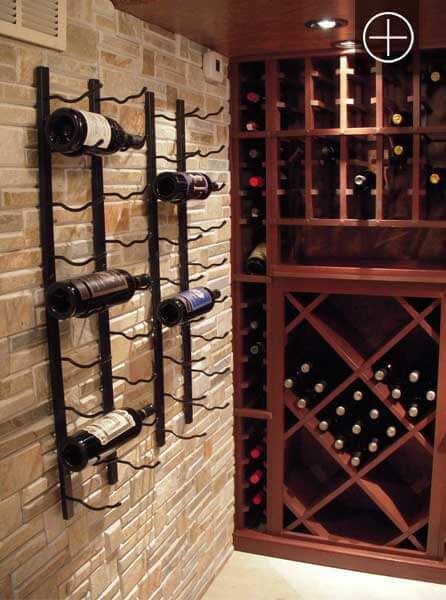 As part of the development of our wine cellar, I spoke with Lisa Pinault last May to see if Vigilant could help me to obtain wine racks since I had been having difficulty acquiring the type of design and materials from other sources. After a fairly short conversation she submitted my ideas to her design people and sent me a draft of plans to meet my request. The five poplar racks which resulted became a focal point of a wine room that has received rave review from our friends, wine and non-wine drinkers alike, over the past year. Custom wine racking was designed and created to complete our client's existing wine room project. The racking is comprised of custom sized individual bottle ladder racks with a high reveal display row. Crafted out of Poplar and stained by the client to match existing cabinetry. Full-glass wine cellar doors with our standard grapevine border and center glass etchings make for a grand entrance to this small wine room. The 10-column slatted arch top lies at the heart of the wine room and includes a double-deep tabletop for storage, display and decanting and has lockers above, LED lighting and our modular base cabinets for increased versatility and locked storage. Utilizing maximum amount of space. This small wine cellar has two walls lined with our floor to ceiling Estate wine racks and bins.